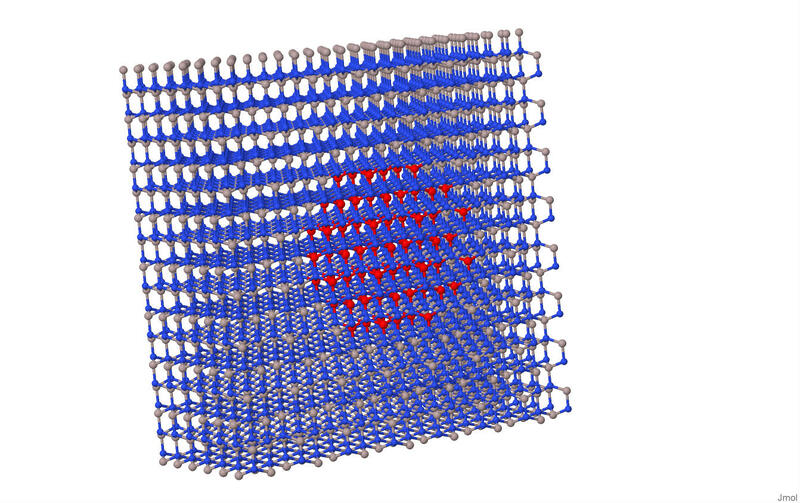 In this Tutorial we will see how to perform the simulation of a GaN/AlN Quantum Dot (QD) structure by employing the Empirical Tight Binding (ETB) Module. We first define an atomistic structure corresponding to the quantum cluster where we want to apply ETB calculations, than we apply continuous simulations on the whole device structure, in order to calculate strain map and equilibrium solution for potentials in device. Then quantum calculations are performed with empirical_tb Module to get the electron and hole states in the QD. In the Device section, the QD heterostructure is described: the GaN quantum dot region (ball), the AlN qbox, an intrinsic buffer AlN region and two n and p-doped AlN regions. The reference region is chosen to provide the lattice parameters with which the crystalline structure is built. In this case the lattice is that of AlN, the material composing the nside region. In the QD region, the GaN atoms are then substituted in the lattice basis. We will see in the following how Elasticity Module is then used to apply strain induced deformation to the mesh which is then projected to the atomic structure of GaN qdot. Elasticity is used here to calculate lattice mismatch induced strain tensor in the whole structure. Moreover, in this case a non-linear calculation is performed, to feed back obtained displacements to the mesh elements. The mesh is thus deformed and a new strain calculation is performed with the new mesh. the strain is computed iteratively until the convergence on the structure deformation is reached. NOTE: This step is required to obtain a correct atomistic representation of a heterostructure. See also in the following, in ETB section. belonging to the model driftdiffusion and associated to the whole device (default choice). The Boundary Regions for drift-diffusion are the two contact regions, defined by the two boundary surfaces anode and cathode. For the atomistic quantum calculations, we define two empirical_tb simulations, named tb1 and tb2. In the first we will calculate the ground states, in the second one these calculate states will be loaded from output file, to complete the calculation of tb states. In both cases the associated region is the Cluster atomistic and the associated potential simulation is the drift-diffusion dd simulation. Note that with this link the potential profile including built-in and polarization fields are correctly included into the TB Hamiltonian, through a correction on the on-site elements. (it's a deafult whenever a strain simulation is performed on the system, as in this case). and the calculation of 4 states is completed, starting from those alreay available. This option may be useful to continue a long calculation of many eigenstates after that it has been stopped by the user for any reason. With the Module opticstb it is possible to perform the calculation of the optical matrix from the TB Hamiltonian. Note that, differently from the analogous Optics Module for EFA, here the initial state and the final state source models must be the same. In this case, we choose tb2 simulation, which compute four eigenstates. The other keywords are similar to those of EFA case. to calculate optical strength output. We may now run tiberCAD to calculate strain with Elasticity (str) and driftdiffusion (dd) for an equilibrium solution. After the execution, the output directory contains, as usual, the results for the simulations performed. As for tight-binding simulation, the file tb2.dat contains a table with the calculated eigenvalues for electrons and holes, together with their occupation index. The files .cube have been also generated, which contain the information on the electron and hole wavefunction (square module). The format of these data files is supported by the visualization software jmol, an open-source Java viewer for chemical structures in 3D http://jmol.sourceforge.net. By using jmol, we can load the atomic structure generated by tiberCAD Atomistic Generator, contained in the file tb1.xyz. Here Ga atom are shown in red. The figure below shows the confinement of the two states inside the spherical GaN quantum dot: in green the conduction state and in yellow the valence state.